Penny Rappa comes to us with a great deal of enthusiasm and experience. 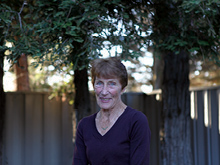 With her husband, Joe and their three daughters, Penny moved to San Luis Obispo County in 1974. She currently lives in Avila Valley, adjacent to the Bob Jones Bike Trail. Penny believes in actively participating in her community. As both a City of San Luis Obispo and County Planning commissioner and a member of the City’s City Council from 1985 through 1994 she has gained a great deal of knowledge and experience. Currently she works for Habitat for Humanity for San Luis Obispo County as both the Executive Director and the ReStore Manager. Recently appointed to the San Luis Obispo County Planning Commission for the 3rd District, she continues her community involvement. In her “spare time” she enjoys her family, grandchildren and gardening. Penny joined the Land Conservancy Board of Directors in 2002 and has served on both the Executive Committee and Finance Committee.